← Krispy Kremes Sweetest Dad Daily Doughnut Giveaway! I have always thought that eggs molded with egg shapers were the cutest things ever. It never occurred to me that something can beat that in the cuteness department. How? 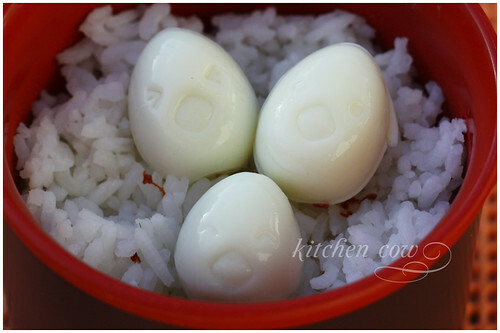 Well, make them tinier by using QUAIL EGG MOLDS! Yes, a couple of months ago, I was finally able to get my hands on a set of quail egg molds (from ebay, if you’re curious). I’ve been meaning to share the pics but I think my large blog post backlog is already common knowledge to most of you. These egg molds work the same way as the large ones for chicken eggs — slip hot peeled hardboiled egg in, then steep in water bath or pop in the freezer for a few minutes. What came out were cute little eggs, three emblazoned with cute chick faces while the other three (only two shown here) were embossed with animal heads. It’s not a tool I’d used on a daily basis, but the instant cute factor they add to food is irresistible. Together with my cute quail eggs, I had some crispy corned beef, steamed rice, and a small fresh salad of iceberg lettuce and tomatoes, to be dressed with a ready-made Japanese vinaigrette. Hearty, yes. Cute, very very much. 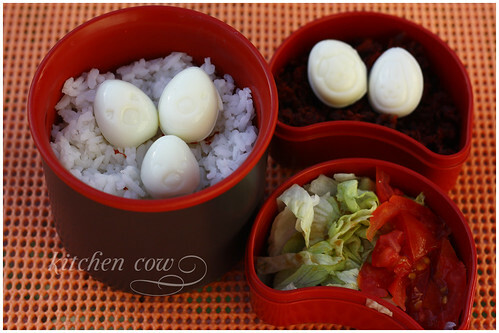 This entry was posted in bento and tagged bento, crispy corned beef, cute bento, egg mold, japanese, quail eggs, rice, salad. Bookmark the permalink. i want panda quail eggs. you could use nori(tama ba?) as the black parts. hehe! so many great products they making for O-bento. omg ang cuuuuute!~ haha parang ayaw mo nang kainin! Hnnn…I don’t remember exactly but I know it was less than 10 USD. Thanks for the link. Gawd I want to shop with them. Unfortunately, they don’t ship overseas. According to a Nihongo-fluent friend at least. Yes, I did I think there’s no one else who was named after me yet… kilala ko ba si kaoko? Where’d you get them? They’re sooooooooo cute! 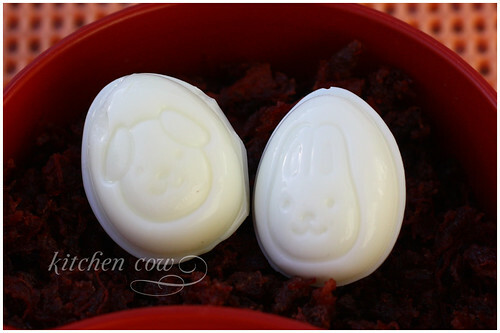 hi, i want to buy the cute egg molds too! i checked ebay pero sa int’l sellers lang meron..
sang japanese store kaya available..? makati area sana. thanks a lot!!! For chicken eggs, you might be able to chance upon them at the local Japanese stores. But for quail eggs, I’ve never seen them locally. International seller rin ako bumili. these are so cute! i really admire your patience in making all these food. i could only wish to have the patience and time to do all that. cheers!